Grumman/Butkus Associates has been nationally recognized for its work, having received Energy Innovation Awards from the United States Department of Energy and numerous regional and international Technology Awards from ASHRAE. 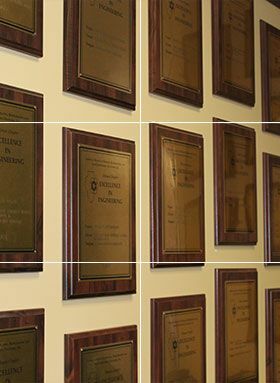 Since 1981, G/BA has also received 76 Excellence in Engineering Awards from the ASHRAE Illinois Chapter. In 2010, R&D Magazine named the Daniel F. and Ada L. Rice Plant Conservation Science Center at Chicago Botanic Garden as its Laboratory of the Year; G/BA was honored as a member of the award-winning architectural and MEP design team. In 2014, Nexant honored the firm with its RCx Cup Award, recognizing the top energy-saving project verified during 2013-14. Our work at Presence Saint Josph Medical Center, Joliet, resulted in identification of conservation measures that yielded electrical savings of more than 2.167 million kWh and natural gas savings of 445,559 therms, with a short payback period. The changes implemented should save the client more than $330,000 a year, with potential for further savings from identified retro-commissioning measures to be considered for the future. In 2014, Hospitality Design magazine honored the Hyatt Regency Chicago lobby renovation project as a finalist in its 2014 design competition (Best Midscale/Economy Hotel category). The project, for which G/BA provided MEP services, was one of only three out of 400 entries to be chosen for recognition in the category. In 2015, Building Design + Construction magazine honored the Johnson Center for Science and Community at North Park University, Chicago, with a Gold-level Building Team Award. G/BA was the commissioning agent for the project, working with VOA Associates, The Boldt Company, Primera Engineers, and Hill Mechanical, as well as construction manager W.B. Olson. In 2017, ENR Midwest magazine cited the Legacy Charter School, Chicago, as its Best Project - K12 Education category. G/BA provided engineering design services. Other team members included Lothan Van Hook Destefano, Rubinos & Mesia Engineers, and W.B. Olson. In 2018, ENR Midwest magazine named the Northwestern University Ryan Fieldhouse and Walter Athletics Center, Evanston, IL, as its Project of the Year, as well as the Best Project - Sports. G/BA provided commissioning services, working with Perkins+Will, WSP, SmithGroup JJR, Affiliated Engineers, and Barton Malow/Walsh Construction.